The tedium of renovation, of meeting deadlines, and of dealing with the insurance company was splendidly broken a few days ago by a visit from JCB and The Gentleman, bearing wonderful wine and even better conversation (click here for her photos from the visit). What felicity that the mile between her parent’s house and my shop is punctuated by an excellent wine store. In a normal year, one in which I haven’t just moved shop and blown up cars, I always have wine glasses on hand for just such visitors, but they were not to be found, so we took some ruby goblets from inventory, and settled in to a variety of chairs—-I in a shabby Directoire knock-off, The Gentleman in a Russell Woodward wire chair, and Janet in a bergere upholstered in somewhat startling purple velvet. Elegant she was, green sweater draped around her neck, against a black chinoiserie screen—-my camera refused to appear for this Kodak moment while they were here (I think JCB hid it), so instead I can only offer a glimpse of the recently vacated chair. After I took the photo, I started thinking about that purple chair: Who else had sat there? A chair like this one has witnessed many lives. Usually we can but guess the stories, but in this case, I had some knowledge of the last seventy years of the chair’s history. 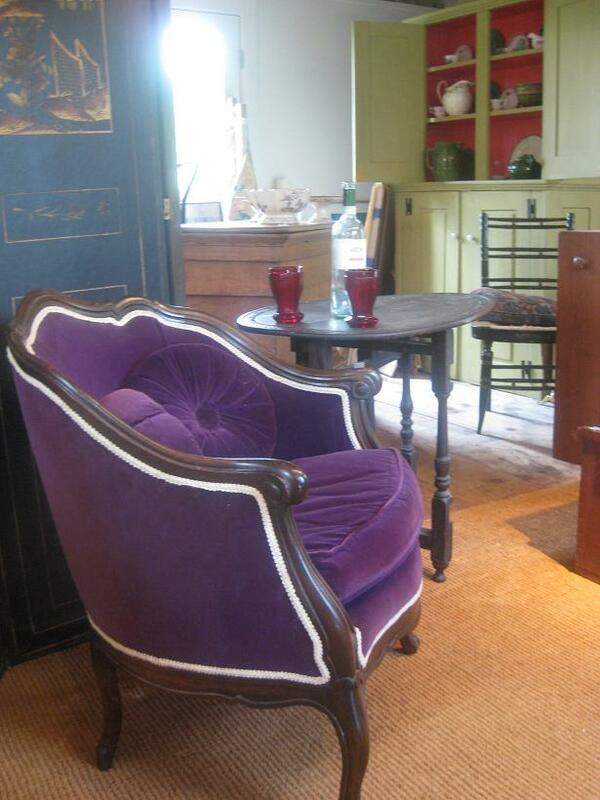 I first met the purple chair nearly 40 years ago in the Down East drawing room of Mme. Pierre Monteux, widow of the great conductor who had so famously introduced Stravinsky’s Sacre du Printemps to a not entirely receptive world. The chair had come to Hancock, Maine, Mme. Monteux’s hometown, by way of San Francisco, where Monteux conducted the San Francisco symphony, after leaving France on the eve of World War II. Left behind in their house at Versailles were most of their furnishings, confiscated and vandalized during Nazi Occupation, and back in America, Mme. 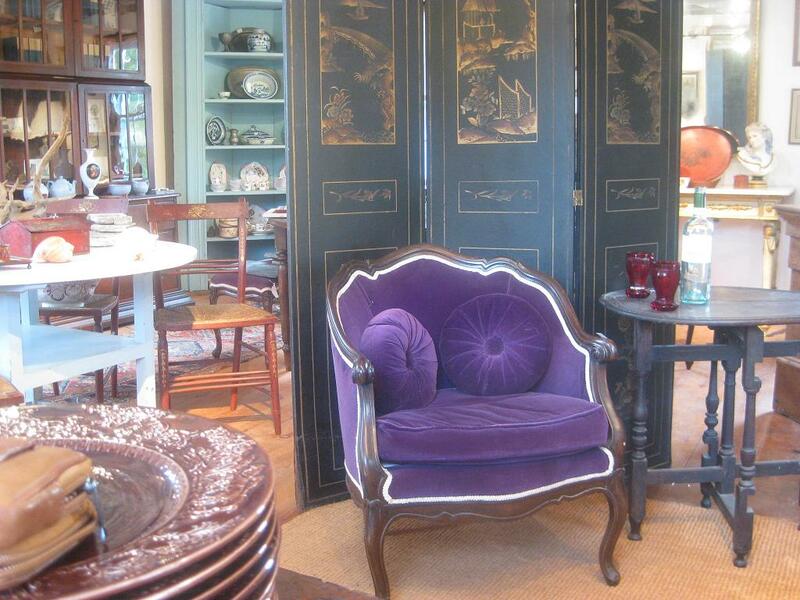 Monteux, a woman of great and bold style, acquired new furnishings for their San Francisco apartment, chic and smart in the style of the day—pale mauve, with jabs of black lacquer and emerald green satin and the chair, upholstered in its unlikely deep purple. After they left San Francisco, everything was shipped to their solid old village house in Hancock—the Venetian chandelier, the lacquer screens, the black and red and green Bessarabian rug, the shimmering mauve satin curtains and pelmets, the French paintings….first time visitors were always stunned, for like Alice through the looking glass, one walked up to the door of this typical Maine house, and passed through to this urbane fantasy, always ready for the tinkle of champagne glasses..
Short and plump, Monteux was known in his family as Chummy, and I remember Mme. once referring to the chair as ‘Chummy’s Chair’. So, Monteux had sat there. As a young musician, he had met the elderly Brahms. So, a man himself famous in the 20th century, who had known one of the greatest composers of the 19th century had sat in this chair. Who else? Monteux had engaged Marian Anderson to sing with the San Francisco symphony. They had a party in her honor. Had she sat in this chair? Who knows? The Monteuxs entertained many of the leading musicians and society figures in their day—-they knew San Francisco bon vivant Whitney Warren, son of the architect of Grand Central. Had he sat here? 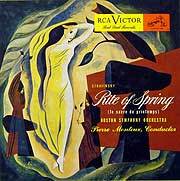 Monteux’s students, Leonard Bernstein, Andre Previn–had they? Monteux’s brother-in-law was the society bandleader Meyer Davis. Surely he’d sat here. And I’d sat more than once on a mauve satin love seat, talking to the Monteux’s lovely, kind, daughter Nancie, one of my favorite people, as she sat in the purple chair. I went to dozens of gatherings in that room over the years; many distinguished guests attended. Think Dilettante, think, who sat in that chair then? Sculptress Chenoweth Hall? Maestro Charles Bruck, who carried on Monteux’s tradition of teaching at the summer school bearing his name? Hmmm, maybe a certain socialite, distantly related to me by marriage, of whom I think far better now than I did then, when I just saw her as brittle and chic, pursuing shallow ambitions in her Bergdorf perfection? 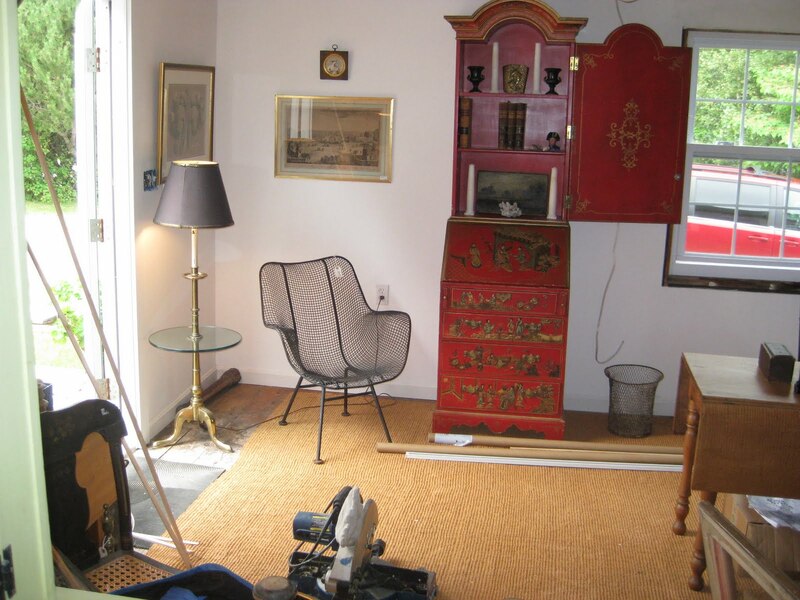 I’m sorry I don’t have a picture of that stylish and improbable room, a bit of 1940’s movie set glamor transported from another time and place to Down East Maine. I first entered it, for my first grown up party, as a late teenager, only a couple of years after Woodstock, and I can conjure it in my mind still, every objet de vertu, every fold of the curtains, and the wonderful people who were there. Still, I wish I had taken a picture….when one is young, one takes it for granted that the people and places one loves will always be there. Now that I’m older, I know sadly better, but how glad I am that they were—-and that for the moment, the purple chair is here to remind me of them on the way to its next act. Couldn't be a more perfect posting. Connections, connections, connections, and wisdom galore. Thanks. Musical chair! Love the story. Fascinating in the JCB and gentleman who took which chair. You might enjoy the chair musings at LE STYLE ET LA MATIÈRE. I think you two might be a bit of kindred souls breathing life into inanimate things. When I moved from a big apartment in a big Victorian house in an old river town to a tiny studio in Chicago, I held what I billed in the paper as an estate sale–even though I was still around–figuring it would attract more of my kind of people than would something called a moving sale. Sure, I needed to get rid of a ton of stuff, but I still wanted it to go to deserving homes. So everyone who bought something also got a copy of John Updike's poem The FurnitureTo things we are ghosts, soft shapesin their blindness that push and pull,a warm touch tugging on a stuck drawer,a face glancing by in a mirrorlike a pebble skipped across a passive pond.They hear rumors of us, things, in their own rumble,and notice they are not where they were in the last century,and feel, perhaps, themselves lifted by tidesof desire, of coveting; a certain moisturemildews their surfaces, and they guess that we have passed.They decay, of course, but so slowly; a vaseor mug survives a thousand uses. Our successiveownerships slip from them, our furyflickers at their reverie’s dimmest edge.Their numb solidity sleeps through our screams.Daguerrotypes Victorian travellersproduced of tombs and temples still intactcontain, sometimes, a camel driver, or beggar: a brownman in a galabia who moved his head, his lifea blur, a dark smear on the unchanging stone. …………………..Anyway, if pieces like your chair can't remember their own stories, we have to do it for them. An excellent post. Good afternoon, Dilettante. A good read – precisely what I needed – and told with humor and grace. I must say that the ruby goblets shine for me like Dorothy's slippers. Thank you for making the images enlargeable – I was able to take a good nose around your store. May drop in one day! Thanks for this one, Dilettante! Your best thus far among the "connective threads" postings. It had mespellbound from start to finish. What a gorgeous post! I wish I was invited to the parties you attended. What a memory to have! This is hot and bothered in Atlanta!! What I wouldn't give to be in MAINE at this moment, I went to Abercrombie, Nova Scotia this August and it just wasn't the same, but I did have a delicious dinner in Halifax how ever! !Ahem, well at least I'm in air conditioning now here in Atlanta, even though I do detest synthetics! But, that's Atlanta! !And btw, the wire chair is actually manufactured by Russell Woodard, which is very much coveted.I know because I scoop up every piece I can find down south to put in my mosquito infested garden. It's hell sitting out yonder, buy it looks wonderful!! Who would know just looking at a chair the storied past it as "lived." Thanks for sharing all this history. 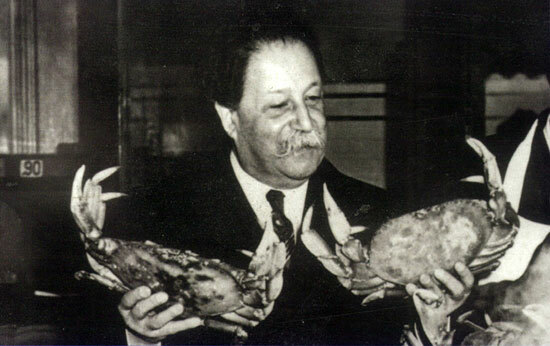 The photo of Monteux holding those huge crabs is priceless. It made me wonder, with the reality of the ocean's current environment, if they even get that big anymore? Fabulous story, wonderfully told. So glad I found your blog. I'm just back from Nova Scotia (Halifax area). Amazing story! I am married to Pierre Monteux’s grandson, Robert Monteux. He is a former ballet dancer and theater performer and resembles Pierre a lot. Unfortunately Claude, his father, and Adeline, his mother, split up when Rob was a boy and he never was around his father much (she remarried to a nice man). I am doing some family research for Robert (who is mysteriously logged into WordPress on my computer, hmm), and would love to hear any more stories! We have a daughter, Jessica, and she has a little girl, Danielle. Just found out that Henri Monteux was taken by the Nazi’s and killed in a concentration camp near Berlin in 1943, he was Pierre’s brother. We are getting him put on the memorial lists, as he was not previously registered. I also collect antiques but just for pleasure. That is a lovely chair and I am glad someone appreciates the history behind it.